Mid-afternoon we drove back about eight miles on the Million Dollar Highway in western Colorado to see what we had missed in the dusky rain the night before. 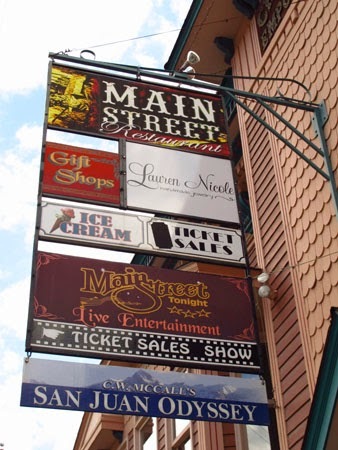 The original toll road from Silverton to Ouray was rebuilt in the early 1920s at considerable cost (hence the name) and became part of the San Juan Scenic Skyway. 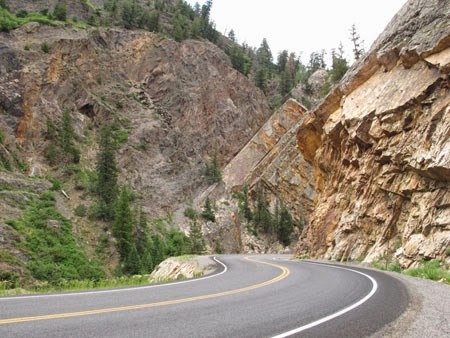 Stretching from Silverton to Ouray, this section of U.S. 550 is potentially hazardous because of its steep cliffs, narrow lanes, no guardrails, and hairpin curves. 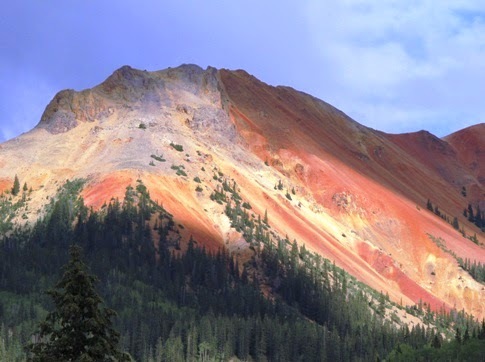 But the scenery is spectacular on the 12-mile stretch through the Uncompahgre Gorge to the summit of Red Mountain Pass. Red rocks glow in the fading sunlight. Low in the sky, the sun cast bright shadows on deep red rocks as we stopped to take pictures of the glowing mountains and a flowing waterfall by a bridge. 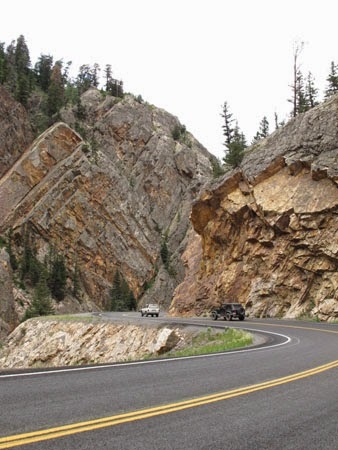 Deep canyons and jagged rock walls formed a backdrop for the severely winding road, which must be navigated carefully since there are steep cliffs and no barriers on the road. Careful driving is necessary on this curvy road. Returning to Ouray, our next stop was Cascade Falls where another rain shower delayed our quarter-mile walk to the scenic falls. But the view of water flowing down red stone cliffs was worth the wait. Wandering in town, we noticed the sign in Maggie’s Kitchen window that claimed the restaurant had been awarded “Best Burger,” so, of course, we had to try it. The cheeseburger was indeed delicious. In 2008 the silver anniversary edition reappeared as a widescreen television production with the original sound track and ever-changing images of the magnificent San Juan Mountains from Bill Fries and his father Bill Fries Sr. 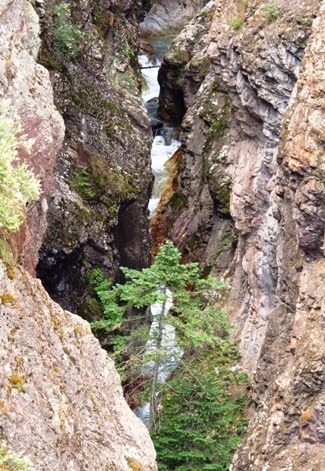 Box Canyon in Ouray, Colorado. The next morning we walked to the Box Canyon since the park's back entrance was just behind our hotel, Box Canyon Lodge and Hot Springs. Box Canyon is an amazingly deep, water-cut gorge highlighted by a sparkling waterfall splashing into a pool before winding its way through the town. Another path, part of the Ouray Perimeter Trail that goes around the town, took us through a tunnel and over a bridge, then onto a side street that led back to the Lodge. 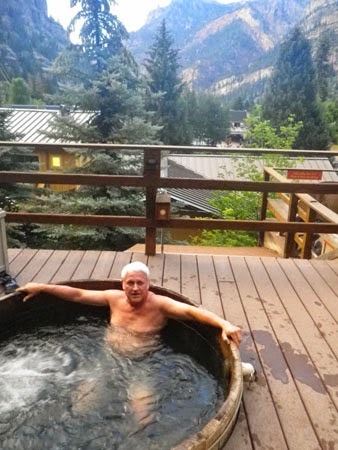 We had just enough time for another soak in the hotel’s hot springs to ease our muscles before continuing our drive on the San Juan Skyway. Visitors not staying at the Box Canyon Hotel and Hot Springs can still get the healing benefit at a large public pool fed by inviting hot springs.